This is circuit Simple DC Voltage Regulator By Transistor C1061. (easy circuit) by this circuit can give Voltage go out about 12V, depend on Zener diode or ZD1 usual use 12V values thus. When you use other value 9V such as get Voltage about 9V also. And this circuit still give current output about 1A depend on transformer. 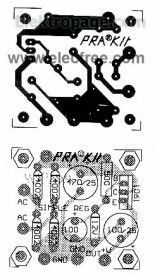 The detail is other request you see in image circuit.